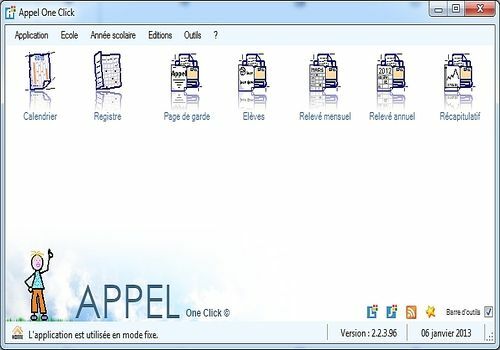 The software Appel One Click is recommended for all school teachers who want to save time in their work. Downloadable free of charge, it sets up a simple and intuitive interface through which you can manage your call registers. So, point out absences and delays, the software will do the rest! Absences may be recorded on a daily or half-day basis, as appropriate. It is possible to break down absences by gender: absences in class, absences from additional educational activities, etc. Appel One Click automatically calculates at the end of each month and school year the averages and percentages based on the number of absences noted for each student in your class. A real time saver that you will certainly appreciate. To make your life even easier, this software automatically and transparently backs up your data. So don't be stressed about losing your information, you'll be able to find it no matter what.